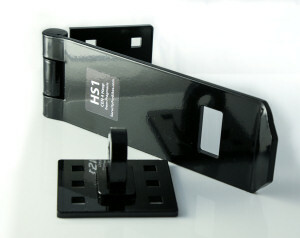 We manufacture the Police-approved HS1 Heavy Duty Hasp & Staple and we also assemble the Beef-Up Kit, to help improve the security of some hasp and staple products and to boost the security of the hinges on the other side of the door. More details on these products are below and on linked pages, as well as being listed in our online shop. We designed our HS1 Heavy Duty Hasp & Staple to be better than any comparable-priced hasp on the market. The photo to the right shows the main components of the HS1 without its fitting kit. It is approved by the Police and by Sold Secure and is CEN 4 rated. It features a hardened staple, has a welded hinge and uses eight concealed coach bolt fixings. It allows the use of closed shackle locks, indeed we designed it to work particularly well with these as the conventional open shackle lock on a shed door is one of the most common things for a thief to defeat. Using a closed shackle lock on a hasp that is designed for it, gives the thief very little to attack. The HS1 hasp is a serious deterrent. It is more expensive than budget hasps, but modest investments to keep thieves out of your shed can be the best investments of all! The Squire No. 8 Hasp & Staple is a cheaper hasp for less demanding situations. The staple and hasp are both made of hardened steel. It is ideal for use with the SS50CS, SS50-S, SS50-C-Combi, SS50-Combi or SHCB65 padlocks. No. 8 Dimensions: Width - 54.2mm, Length - 216.0mm, Staple Diameter - 10.0mm, Staple Clearance - 25.0mm. The photo to the right shows the No. 8 with a 50p coin for scale. We recommend this item is used in conjunction with a closed shackle padlock such as the Squire SS50CS and also a Beef-Up Kit to increase the security level. This is because the standard product from Squire includes a coach bolt for the hasp side, but only woodscrews for the staple side, so this can be vulnerable to being prised away from the woodwork. The Beef-Up kit provides some 60mm long countersunk-headed machine screws that can replace two of the wood screws for the staple and thus make it much more resistant to attack. Beware that the hasp side of the No. 8 includes a folded tongue that is intended to go onto the edge of the door, in the crack between the door and frame, so this hasp is not suitable for fitting to doors that don't have a frame coming to the edge. Door hinges are common attack points for thieves and if you have hinges that are simply held in position with wood screws and no coach bolts, our Beef-Up Kit may help as it provides a selection of bolts etc to help you bolt right through the door and frame such that it is no longer a case of just pulling out some wood screws with a crowbar. If you have a hasp & staple that only uses wood screws on one or both sides, again, the Beef-Up Kit may be able to help (e.g. with the Squire No. 8, the Beef-Up Kit includes some bolts to replace two of the wood screws that Squire supply for fixing the staple). Click for more explanation on the Beef-Up Kit.